These lights have glass lenses, not plastic. Light guards are constructed of sturdy aluminum diamond plate and attach with stainless steel hardware. 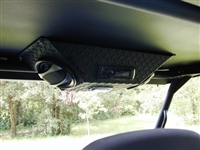 Universal for all UTV’s or any vehicle with a flat, non contoured roof. This is a complete blue tooth radio including AM/FM/CD, remote control and has an aux. jack on the removable faceplate. 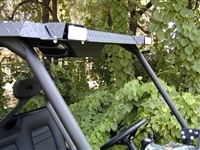 This Kawasaki 3010-4010 Trans roof is constructed of rugged 1/8 inch aluminum diamond plate that is powder coated matte black. It is a one piece roof that is fully trailerable.